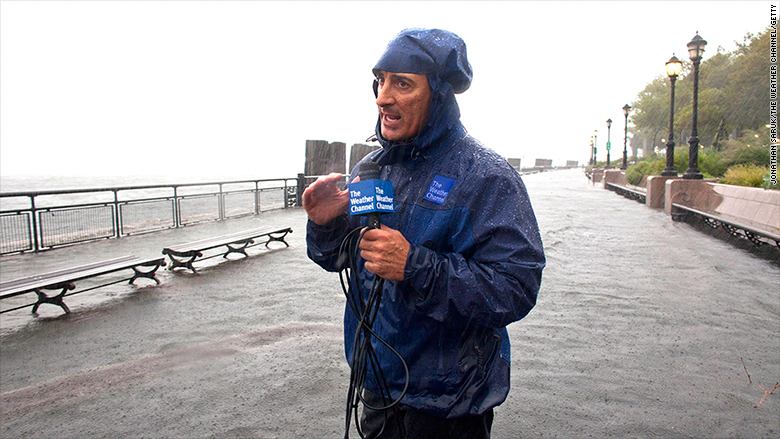 Weather Channel correspondent and anchor Jim Cantore. Another storm is brewing between The Weather Channel and one of its biggest distributors. Last year it was DirecTV, which dropped the channel for three months. Now it's Verizon FiOS, which abruptly removed the channel from its television lineup on Monday night. The Weather Channel is crying foul, accusing Verizon of taking the action "without warning," and urging its fans to complain to the television distributor. Verizon's (VZ) rhetoric is reminiscent of what DirecTV (DTV) said last year: That people no longer need the Weather Channel to find out about the weather. "In today's environment, customers are increasingly accessing weather information not only from their TV but from a variety of online sources and apps," a Verizon spokesman said in an email. During the DirecTV blackout, I wrote that it "exposes a challenge for television channels that carry weather, news and other types of information that are increasingly accessible on the Internet. The channels have to ensure that they're providing something the Internet can't -- and that may be getting harder and harder to do." One thing that does differentiate the Weather Channel, however, are dramatic live pictures from areas hard-hit by storms. Verizon has, for now, replaced the channel with the AccuWeather Network, which has been trying to compete with the Weather Channel. But AccuWeather doesn't have the breadth and depth of correspondents, camera crews and affiliates that the Weather Channel does. In its statement about Verizon's decision on Tuesday, the Weather Channel emphasized its saturation storm coverage. "During a winter with record-breaking storms and severe weather, The Weather Channel responded with non-stop live coverage, including the ongoing presence of our crews reporting live from hard-hit communities within the Verizon FiOS footprint," the company said. The channel also noted that it recently reupped its distribution deals with several other providers, including Time Warner Cable (TWC). "We urge FiOS customers to contact Verizon and voice their displeasure," it said. These disputes are often about financial terms -- how much the distributor will pay for the channel -- and they're usually resolved pretty fast. The Weather Channel/DirecTV tiff, however, dragged on for three months. At the time, analysts warned that the Weather Channel could suffer from similar fights in the future. So how will this one play out? When I called this new situation a "dispute" in a tweet on Tuesday morning, Verizon spokesman Bob Elek objected -- he said "this is a decision, not a dispute." "Our desire to reduce overall content costs certainly played a role in the decision to not renew" the Weather Channel, he said. But he argued that money is not the overriding factor: "Technology has dramatically shifted the delivery of both routine and critical weather information over the past 30 years or so."